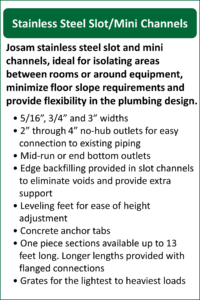 Josam Company offers a complete line of 304 or 316L Stainless Steel floor drains, retrofit liners, cleanouts, trench drains, slot and mini channels, and shower channels. Material Benefits – Manufactured in type 304 or 316L austenitic stainless steel. 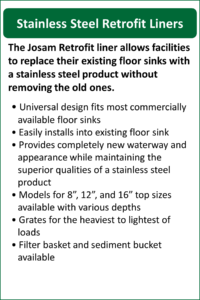 Due to these superior properties, Josam Company’s stainless steel drainage products are extremely hygienic. 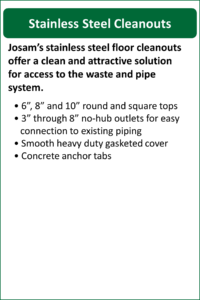 With bacteria growth on drains becoming more of a concern in many applications, the demand for the non-porous surface and hygienic characteristics continues to increase. In addition to hygienic benefits, stainless steel offers greater life expectancy and meets new requirements for a sustainable design. Custom Products – Josam Company offers customized stainless steel products to suit your individual project requirements. 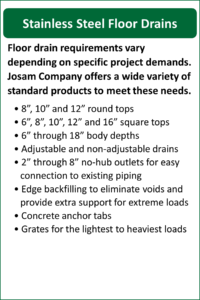 For more details on custom applications please contact your Josam representative or contact a Josam customer service specialist. Dedication, Service, and Commitment – Josam Company has worked with owners, architects, engineers and installers to ensure that the products we provide meet their requirements. Josam takes pride in the dedication of our customer service and engineering departments. 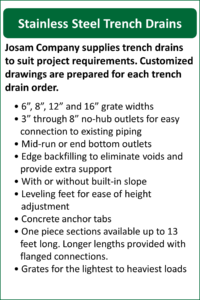 Our technical staff welcomes inquiries for both standard and custom products and are poised to offer product advice to assist you in your specific project needs. We are committed to providing only the highest quality products and are sensitive to the time constraints in today’s accelerated construction schedules. 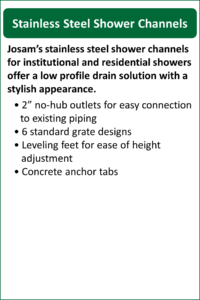 Josam’s Stainless Steel drainage products are available with an optional Push-Fit outlet (PFO) for an easy connection to the Josam Push-Fit Drainage System. For more details, contact your local Josam Representative.